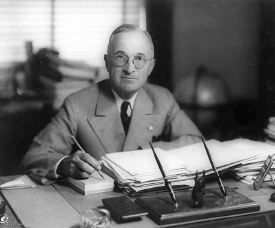 Harry Truman: "I never did give them hell. I just told the truth, and they thought it was hell." It occurs to me this morning this is one of the most American ideas out there. "If you can't stand the heat, get out of the kitchen," another Trumanism. At dinner last night in a discussion about the future of the University of California Journalism School, I figured something out. Journalism has always been about the sources, but somehow we lost our way and focused on the reporters, the conduits, the pipes. Okay, so the way we move news from sources to their destinations is changing, but when it's all done, the news process yields the same result. So this explains why a 140-character limit in Twitter is so in tune with our times. It teaches us how to summarize, to condense, and it rewards those of us who are good at it by making our ideas go further. It also levels the playing field. Last night there was a 5.0 earthquake in southern California. Not a big one, but Twitter had the full story within a minute. Was there more to say, for cameras and analysts to pore over? Not this time. 140-characters was plenty. Update: The buck stops here. 20 characters, including punctuation. Last update: 1/9/2009; 9:39:51 PM Pacific. "It's even worse than it appears."